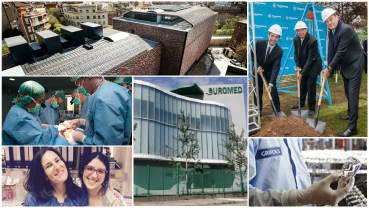 The month of November has been full of news from companies and research organizations in the BioRegion: remember, you can get them every day in your email by subscribing to our free press-clipping service. And if you have three minutes, here's a summary of the month's highlights. The journal Nature has once again looked at Barcelona and the growth of the Catalan capital and other second-tier cities joining the global scientific elite: the Nature Index 2018 Science Cities highlights the increase in scientific production in Barcelona, with 997 highly quoted articles in 2013, up 156% from 2000. Also this month, professionals from the worlds of science, politics and diplomacy have presented the SciTech DiploHub project to make Barcelona a benchmark in science and technology and the first city in the world to implement a Science and Technology Diplomacy strategy. Here at home, Expansión highlights that specialized biotech venture capital now has more than €250 million to be invested in new biomedical or digital health start-ups. If you want to know more, Biocat will be presenting the most recent edition of its Biocat Report, with the latest data on the sector, on December 5. Pharmaloop, a Laboratorios Salvat company, will invest €35 million to build a new plant for the development and manufacturing of pharmaceutical products in Alcalá de Henares. And from Madrid to Catalonia: the Inkemia corporate headquarters will return to Mollet del Vallès in early 2019, after having moved to Madrid in October of last year. Additionally, Inkemia is preparing to go public in Europe, with the goal of joining the Euronext Growth stock market. Devicare also continues to look abroad, carrying on with its international expansion with distribution deals in Singapore and Malaysia. Reva Health has closed a business alliance with French group HRA that will allow them to triple their sales, to €24 million. Pangaea Oncology has renewed its global licensing and distribution deal with Synlab for liquid biopsy through 2023. The Catalan company saw sales increase 33% in the first half of 2018. Furthermore, Sequentia Biotech has launched spin-off Biotech Tricopharming Research to produce and market Artennua, a new therapeutic agriculture product. In the chapter on funding, FreeOx Biotech has closed a €500,000 round for its molecules to treat stroke and other diseases of the central nervous system. Rheo Diagnostics has opened a round of investment with Capital Cell, hoping to raise €350,000. On this same crowdfunding platform, Ability Pharma has already surpassed the €1-million goal it set for its campaign. Also this month, Ability Pharma was granted orphan drug designation for ABT0812 to treat biliary tract cancer. Lipotec has launched an open innovation portal to expand the network of collaborators and receive proposals for innovations with application in cosmetics. US fund Riverside has closed the deal to sell Catalan pharmaceutical company Euromed to German Dermapharm for €300 million. They are also looking for buyers for Ferrer, which is looking to sell off its generics units in Spain, as well as chemical products and vaccines. This operation would bring in nearly €100 million. Amgen has begun marketing Amgevita, a biosimilar of the reference product Humira (adalimumab) to treat inflammatory diseases. Gebro Pharma has also expanded its portfolio, investing more than €9 million in new products. Among others, it has acquired a drug from Mallorca-based company Biowise with the goal of growing its urology area in Spain. Grifols is also out shopping, negotiating with Shanghai RAAS pharmaceutical laboratory to acquire the Chinese company for €4.4 billion. German company Biotest will also participate in this operation. Grifols has seen profits rise 8.5% over the first nine months of the year, to a total of €468 million. Many other publicly traded companies have announced their results this month. At Almirall, they are "encouraged", in the words of the CEO, by these latest results: the pharmaceutical corporation posted profit of €93 million through the end of the third quarter, compared to €99.7 million in losses for the same period in 2017. Oryzon Genomics has also given its investors reason to celebrate, cutting losses by 89% from January to September this year compared to the same period last year. Medcomtech, however, has earned 5% less and lost up to €4.7 million in the first half of 2018. Reig Jofre closed the first nine months of the year with earnings of €4.2 million, up 30% from the same period last year. Rovi saw profits of €15.7 million in the first nine months of the year, down 8% from 2017. Let's start the chapter on research by highlighting that the Research Institute of the Hospital de la Santa Creu i Sant Pau has inaugurated its new building, which will now house all of it scientific activity. In this new era, the institute hopes to promote more interaction among its more than 50 research groups to improve the quality of the research done. Institute for Bioengineering of Catalonia (IBEC) and the Polytechnic University of Catalonia (UPC) have discovered a mechanism that allows for super flexibility in cells, for example in a beating heart or breathing lungs. The results were published in Nature. Barcelona Institute for Research in Biomedicine (IRB) has shown that DNA damage and repair processes could play a role in the generation of sequence periodicity in the genomes of eukaryotic organisms, from yeasts to humans. The study was published in Cell. Also in Cell, the IRB and the Center for Genomic Regulation (CRG) described how fibroblasts, which give skin its integrity, turn into fat cells with age. The researchers have discovered a previously unknown ageing process that could be found in other organs, as well. In oncology, a study led by the IRB and published in Nature Cell Biology suggests that therapies that inhibit epigenetic factors could later lead to more aggressive tumors. For their part, Bellvitge Biomedical Research Institute (IDIBELL) and the Catalan Institute of Oncology (ICO) have discovered the mechanism of action of the PIK3CA gene, which is key in forming the blood vessels involved in cancer and vascular malformations. The study was published in Nature Communications. In Chemical Communications, IRB Barcelona presented a molecule derived from scorpion venom that can cross the blood-brain barrier and could be used to transport drugs into the brain. A study coordinated by Hospital del Mar, in which Vall d’Hebron, the Center for Genomic Regulation, Son Espases and Mútua de Terrassa also participated, has identified a gene shared by patients who have the worst recovery from a stroke. This genetic alteration could be key in finding an effective treatment. For their part, researchers at the University of Barcelona and Tohoku University (Japan) have designed in vitro neural circuits with the segregation and integration capacities of brain circuits, using neuroengineering tools, which help understand important aspects of brain reconfiguration. The study was published in Science Advances. Hospital Vall d’Hebron has become the first center in Spain to use magnets to simplify surgery in babies. Bellvitge University Hospital has also introduced a groundbreaking technique. It is the third hospital in Spain to do live-donor kidney transplants using robotic surgery, which reduces the risk of complications. This hospital has also, in conjunction with the Catalan Institute of Oncology (ICO), set up a specific unit for patients with head and neck cancer who haven't seen results from conventional therapies. Also for oncology patients, the Hospital de Sant Pau Nuclear Medicine Service has installed a new, totally digital PET-CT that makes the test faster. It is the first of its kind in Spain and one of the first in Europe. Hospital del Mar has launched a virtual dispensary to monitor and adjust the treatment of patients with sleep apnea, a groundbreaking strategy in Spain. Germans Trias i Pujol Hospital has inaugurated its new gynecology and obstetrics facilities. Additionally, businesswoman Carmen Godia has confirmed the Quirón group has acquired three hospitals previously owned by Banco Sabadell for nearly €200 million. The money raised in the 2017 edition of La Marató de TV3 will fund 36 biomedical research projects focusing on infectious diseases. The 55 scientists who will carry out this research received their awards at an event held at the Acadèmia de Ciències Mèdiques i de la Salut de Catalunya i de Balears. Additionally, the La Caixa Foundation has awarded new grants for research in 2018. A total of €26 million has been awarded in 75 grants to programs for postdoc researchers and biomedical projects. The government of the United States has awarded a €2-million grant to a trial to study new response markers for prostate cancer treatment. Vall d'Hebron Institute of Oncology (VHIO), National Cancer Research Center (CNIO) and the University of Washington are participating in the study. In the business arena, nine Catalan SMEs have received €450,000 (€50,000 each) from the European Union for their innovative ideas, through the SME Instrument call. Recipients include Color Sensing, Virtual Bodyworks and Ahead Therapeutics. And to finish up, news on female empowerment: the Government of Catalonia will be launching the EMPOWA project to help entrepreneurial Catalan women gain access to European innovation funding. The goal is to improve the ratio of female founders, CEOs and executives who submit applications to the European Commission's SME Instrument.